This statistic displays a ranking of highest-paid celebrities between June 2017 and June 2018. In that period, Floyd Mayweather was the highest earner, with an annual income of 285 million U.S. dollars. Kylie Jenner ranked third in the Celebrity 100, with an income of 166.5 million U.S. dollars, closely followed by Judy Sheindlin with an income of 147 million. Rock bands U2 and Coldplay also featured in the top ten, as well as musician Ed Sheeran whose album 'Divide' was the top selling music album in Canada in 2017. The highest sportsman on the list is soccer player Cristiano Ronaldo, Portugal’s all-time top goal scorer, who earned 108 million U.S. dollars in 2018, just 3 million lessthan his closest rival, Lionel Messi. Ronaldo captained Portugal to their first European Championship title in 2016, beating hosts France 1-0 in extra time in the final. 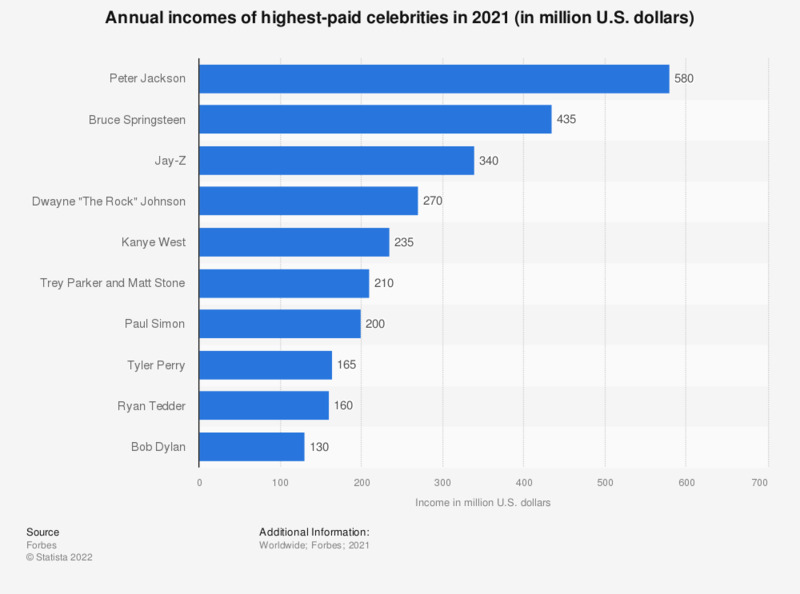 The income of each of the celebrities is an estimate, including such sources as upfront pay, profit participation, residuals, endorsements and advertising work. To what extent does the statement "In terms of fashion I let myself be influenced by stars/well-known figures" apply to you personally? Which couple* of actors would you like to see dance in a movie? How much attention have you paid to each of the following scandals?